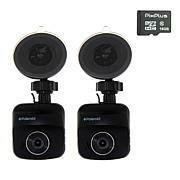 Record your road trip with this dual-lens dash cam. 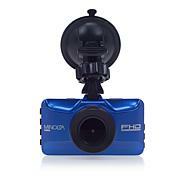 It's main camera records in 1080p full HD for crisp, clear images of the road ahead. 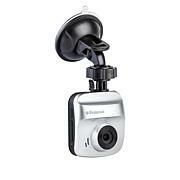 The smaller camera records at 720p and can be positioned backwards for a view of the rear of your vehicle. It automatically starts recording when you start up and loops to record over the oldest footage first. It also automatically saves recent footage when it detects a collision. 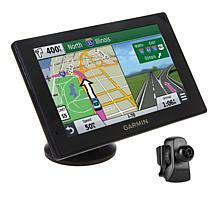 Giini gives you peace of mind and a video record of all your driving adventures. Great view of the surrounding area while you drive . Clear picture, Works as advertised and a great safety feature. We had just installed it but didn't have it turned on when a guy approached my car at a big box parking lot asking for $1. I turned the smaller camera towards him and he left immediately. I was back. as very excited when I opened the box. The size of the cam is a great size. The picture is clear and you can video. Easy to use and set up. Love it. When I received this, I couldn't wait to put it in my car. It has such a clear picture of the front and back of the car. There was a car riding practically on my bumper yesterday. I turned the rear camera towards them and they backed right off of my car!